The Arkenstone Dallas Gallery is our new and current headquarters. Over several decades since Dr. Robert Lavinsky opened The Arkenstone, the company has gone through several expansion phases. In 2010, The Arkenstone moved to our 10,000 square foot headquarters in Dallas, Texas. 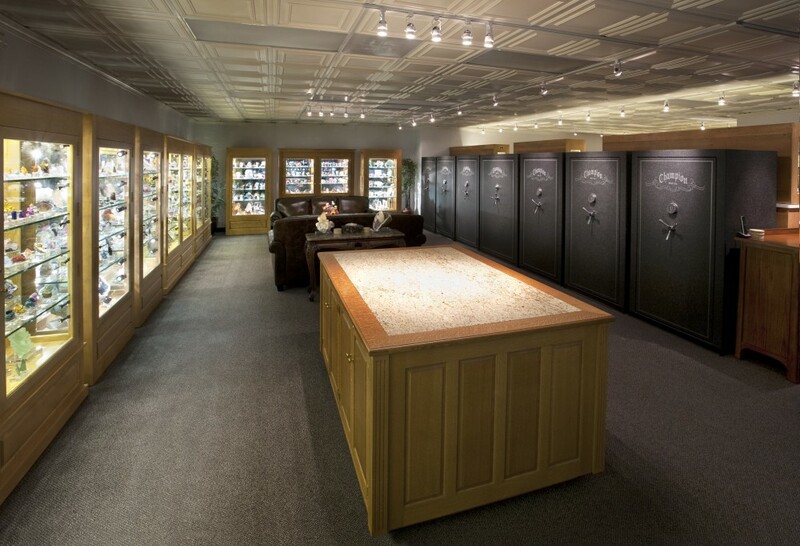 In addition to the 4,000 square foot fine mineral gallery with wall-to-wall display cases, The Arkenstone Dallas Gallery headquarters also is the home to our essential operations and activities. The Arkenstone maintains several full-time photographers on staff who specialize in mineral photography. With years of expertise in capturing fine mineral specimens, our photographers would be happy to assist you in taking professional photos of your favorite specimens. For more information and to request quotes, please contact gallery@iRocks.com. Our sister site, www.MineralAuctions.com, is the world's largest online mineral auction site. With hundreds of fine mineral specimens auctioned off monthly, it's possible to find some great deals by browsing the site! Most of these pieces come from the acquisition of famous mineral collections. Due to the volume of pieces in many of these acquired collections, The Arkenstone is often forced to select the premium pieces to keep in the gallery while releasing other pieces to be auctioned. While all of the specimens are great, we simply don't have the space to keep them all, so help them find a new home in your collection. Our auction offices are located in the Dallas gallery. For the best and most aesthetic display of your minerals, consider the use of custom lucite bases for your specimens. Not only will these pieces look better on custom bases, but they will also be safer and more secure. Every base is made on-sight by hand in the Dallas gallery to best display each specimen. Custom engraving of mineral species and locality is included for each base made. Pricing and additional information is available here. For all shipping to and from The Arkenstone and MineralAuctions.com, the Dallas gallery has full shipping and logistics operations conveniently located on site. Whether customers need shipping across town or across the world, The Arkenstone staff is experienced at safely packing and shipping delicate fine mineral specimens. Additional information can be found on our Order Mineral Specimens page. Our friends at BlueCap Productions captured the opening of our new gallery in their DVD, The Arkenstone: Grand Gallery Opening. When planning for the opening party, several notable mineral lovers offered to make brief presentations at the event, including Dr. Eugene Meieran and Apollo 17 astronaut Harrison Schmitt. This event launched the idea to create The Dallas Mineral Collecting Symposium, which has become the premier mineral education event in the world. The Arkenstone: Grand Gallery Opening DVD is available for purchase through BlueCap Productions.